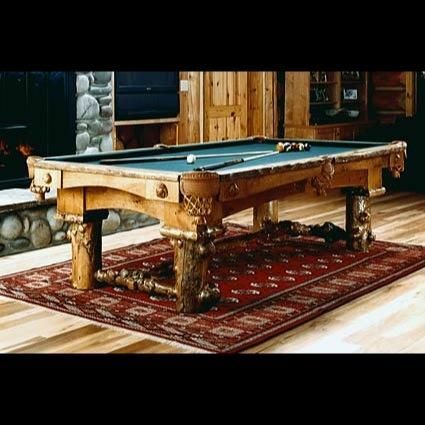 This pool table features a rare assemblage of hard-to-find burl accents and medallions. The Firehole represents the zenith of our efforts in both materials and craftsmanship and is a true tour de force in billiard tables. This table features a rare assemblage of hard-to-find burl accents and medallions. The Firehole represents the zenith of our efforts in both materials and craftsmanship and is a true tour de force in billiard tables. (see detail) Legs and supporting center members reveal the gnarled beauty that is unique to burled branches and logs. All joints are expertly mortised and tenoned. Shown is Burl style. Also available in Standard and Wilderness styles.